To Cite: Alavi S M, Roozbeh F, Behmanesh F, Alavi L. Antibiotics Use Patterns for Surgical Prophylaxis Site Infection in Different Surgical Wards of a Teaching Hospital in Ahvaz, Iran, Jundishapur J Microbiol. 2014 ; 7(11):e12251. doi: 10.5812/jjm.12251. Background: Despite the effectiveness of prophylactic antimicrobials to prevent surgical site infection the use of antibiotic prophylaxis is often inappropriate. Objectives: The current study aimed to determine the pattern of prophylactic antibiotic use in a teaching hospital affiliated to Jundishapur University of Medical Sciences, Ahvaz, Iran. Patients and Methods: The current descriptive study included 8586 patients who received prophylactic antibiotics before surgery from April 2011 to March 2012, in Razi Hospital affiliated to Jundishapur University of Medical Sciences. Indications for antibiotic use, proper or inappropriate antibiotics, an antibiotic or combination of antibiotics, dosage and length of treatment for each patient based on the infectious disease textbook (Mandel's Principle and practice of infectious diseases) definitions were administrated. Results: Of the total 8586 patients who took antibiotics for preventive purposes, 4815 (56%) required antimicrobial prophylaxis, and 3771 (44%) patients did not. Of the 4815 patients who received prophylaxis, 86.9% received it appropriately, 13.1% received it inappropriately; 8.2% received inappropriate dosage, and 9.5% received antibiotic longer than 24 hours. Conclusions: The current study revealed that 44% of those who received prophylaxis did not need it. In the patients who received antibiotics, the most common mistakes were antibiotic selection followed by prolonged prophylaxis (> 24 hours) and excess dose. In the recent years, in response to the medical improvements, the field of infection control has progressed by cooperation of the epidemiology with health sciences to decrease risk factors for health care-associated infections (HAls); therefore, interventions to prevent HAls should be implemented. The primary role of an infection-control program is to reduce the risk of nosocomial infection through protecting patients, employees, health care students, and visitors (1). Health care-associated infections are reported in 1.7 million cases annually in the United States with approximately 100,000 deaths (2). The functions of a hospital epidemiology program vary from institution to institution, but can be generally divided into the following areas: surveillance, outbreak investigation, education, employee health, the monitoring and management of institutional antibiotic use and antibiotic resistance, the development of infection-control policies and procedures, environmental hygiene, and new-product evaluation. Nearly 60% of the admitted patients receive antibiotics, and antibiotic usage varies widely across hospitals (3). The hospital epidemiology program should monitor the current antimicrobial status and susceptibility profiles on a regular basis to observe the trends in the development of antibiotic resistance. The results should be adjusted with the antimicrobial agents currently used in the hospital. The best data are obtained if prophylactic antibiotics are distinguished from antibiotics used for treatment. Efforts should be made to optimize antimicrobial prophylaxis for surgical procedures, optimize selection of the first choice antibiotic and duration of empiric antimicrobial therapy, and improve antimicrobial prescribing practices. A variety of approaches can be undertaken including educational, administrative, e g formulary restrictions, and direct interventions by a team that manages antimicrobial use in the real time (4). Post operation wound infection is a major cause of morbidity, mortality, and health care costs. A considerable proportion of the millions of operations in the world each year are complicated by a surgical site infection (SSI) (5). Mortality rates and hospital readmission rates are significantly increased. Post-surgery infections increase the length of stay and charges. When an SSI occurs, hospital readmissions and health care services at home increase (6). The effectiveness of prophylactic antimicrobials to prevent SSIs was established in the 1960s. The use of antibiotics to prevent postoperative infections plays an important role in reducing the incidence of postoperative infections, duration of stay in hospital, cost of treatment, mortality, and helps the patient go back to the normal life more quickly (7). Locally published studies (in Farsi) indicated that antibacterial agents, ranked second after analgesic drugs in Iran and the consumption of these drugs in the country shows positive trend over the years. Although it was expected that the new antibiotics reduce the number of deaths and the incidence of infectious diseases, in practice they did not (8, 9). Indeed, increasing the incidence of infectious diseases caused by bacterial resistance against antibiotics, emerging and re-emerging of infectious diseases, and mortality of nosocomial infections are mostly due to the incorrect use of antibiotics that is a major health problem in the country (8, 10, 11). However, despite the effectiveness of prophylactic antimicrobials to prevent SSIs, the use of antibiotic prophylaxis is often inappropriate. Previous reports indicated that timing of administration, selection of the antibiotic, and duration of prophylaxis were inappropriate in the great majorities of cases (5, 7, 12-16). While antibiotic prophylaxis is common in surgical procedures, inappropriate use of antibiotics occurs in 25% to 50% of the general elective surgeries (17). Unnecessary use of antibiotics and prolonged antibiotic prophylaxis (more than 48 hours) are significantly associated with increased risk of antimicrobial resistant microorganisms (7). To establish strategies for rational use of antibiotics to prevent SSI in hospitals, it is necessary to be aware of the current status of antibiotic use patterns. Searching the database of Ahvaz University of Medical Sciences (published dissertations and articles) shows that official reports or studies in this field in Khuzestan province do not exist; therefore, the current study aimed to determine the prophylactic antibiotic use patterns in a teaching hospital affiliated to Jundishapur University of Medical Sciences. From April 2011 to March 2012, this study performed in Razi Hospital affiliated to Ahvaz Jundishapur University of Medical Sciences. Cefazolin is the selected antibiotic for cardiac, orthopedic, vascular, and neurosurgery operations; where Methicillin Resistant Staphylococcus aureus (MRSA) is suspected to cefazolin, the study shifted to vancomycin and in the case of anaerobic pathogens exist, metronidazole was added. Dose and timing of antibiotic is defined as proper if infusion of one to two grams cefazolin, one gram vancomycin or 500 mg metronidazole started 60 minutes before incision and repeated three to five hours cefazolin, six to eight hours metronidazole, or 12 hours vancomycin after the first dose. Duration of prophylaxis was considered sufficient if lasted less than 24 hours, except 48 hours for cardiac surgery. The 8586 patients who received prophylactic antibiotics before surgery were enrolled. Patients were studied according to the type of surgery, the department they were admitted in, and the regimen of antibiotic prophylaxis. All variables were analyzed including demographic characteristics, underlying diseases, type of illness, kind of surgery, received antibiotics, the mode and dose of antibiotic, and the length of treatment. Indications for antibiotic use, proper or inappropriate antibiotics, an antibiotic or combination of antibiotics, dosage, and the length of treatment for each patient were administrated, based on the abovementioned definitions in the textbook of infectious diseases (7). The data were analyzed by SPSS-16 software using descriptive statistics. Of the total 13763 patients 47.5% and 52.5% were male and female respectively, 8945 procedures were clean, 3440 were clean-contaminated, 963 were contaminated and 412 were dirty. The 8586 patients underwent preoperative antibiotic prophylaxis. Of the total 8586 patients who took antibiotics for preventive purposes, 4815 (56%) required antimicrobial prophylaxis, and 3771 (44%) patients did not. Unnecessary use of prophylactic antibiotics was observed in 3771 (44%) patients. Of the total 4815 medical procedures requiring antimicrobial prophylaxis, all received it. Of the 4815 patients who received perioperative prophylaxis, 4182 (86.9%) cases received it appropriately, and 633 (13.1%) received it inappropriately, 397 (8.2%) cases received inappropriate dosage, and 457 (9.5%) cases received antibiotic longer than 24 hours. Certain patients received both incorrect drug dosage and duration. Characteristics of procedures are shown in Table 1. The used antibiotics are shown in Figure 1. Cefazolin, vancomycin, gentamicin, and metronidazole were the most commonly used drugs for prophylactic purposes. The frequency of patients who received cefazolin in the departments of obstetrics, general surgery, and orthopedics was 4261, 2457, and 2322, respectively. The frequency of patients who received vancomycin in the departments of obstetrics, general surgery, and orthopedics was 2025,820, and 705, respectively. The number of patients who received gentamicin in the departments of obstetrics, general surgery and orthopedics was 1152, 2300, and 1025 respectively, and the number patients who received metronidazole in the departments of obstetrics and general surgery was 512 and 1750, respectively. 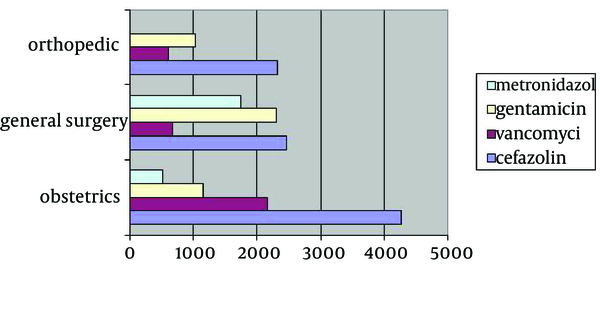 The frequency of patients who received these antibiotics is shown in Figure 1. Antimicrobial selection, cefazolin, vancomycin, and metronidazole, was appropriate in most of the cases except for gentamicin. Unnecessary use of gentamicin was observed in all surgery departments. Comparison of the hospital departments for prophylaxis and unnecessary prophylaxis are shown in Tables 2 and 3. Comparison of the hospital departments for incorrect antibiotic regimen, inappropriate dosage of antibiotic, and the length of treatment are shown in Table 4. The most unnecessary antibiotic use was observed in general surgery ward and the most inappropriate antibiotic regimen, wrong dosage, and length of antibiotics were observed in obstetrics ward. Of the six infection prevention measures, three core measures contain recommendations regarding the selection of prophylactic antibiotics, timing of administration, and duration of therapy (12). In the current study, for most of the patients undergoing clean-contaminated surgeries, gastrointestinal, orthopedic, and gynecologic, infection control committee recommended an antibiotic regimen including the first generation cephalosporin such as cefazolin or vancomycin, when MRSA infection is suspected; with or without metronidazole, if anaerobic pathogens were likely, as the choice antibiotic regimen to prevent post operation infections. Results of the current study revealed that the current patterns of using antibiotics to prevent surgical infections in Razi Hospital were not favorable. In total, approximately 45% of antibiotics were prescribed without indication and were unnecessary. Approximately 13% (8.2% to 13%) of the indicated antibiotic prophylaxis was inappropriate at least in antibiotic regimen, dose, or duration of antibiotic administration. In spite of hospital infection control recommendations, the application of prophylactic antimicrobials to prevent SSIs and use of antibiotic prophylaxis were often inappropriate. Published studies indicate that the antibiotic regimen selection, timing of administration, dose of antibiotic and duration of prophylaxis in majority of the cases is inappropriate (5, 7, 12-16). For example it is administered when not required, not administered when required, or not administered properly (7, 15). In contrast to the findings of other studies, however, the prescription of antibiotics in Iranian hospitals is irrational, it is not higher than those of the other regions of the world, but it is still unacceptable. The present study found that approximately 42% of the studied patients received appropriate antimicrobial prophylaxis. Prophylaxis was inappropriately performed in 13% of 4,815 patients requiring prophylaxis. In the current study, 3771 (about 44%) patients received preoperative antibiotic, but they did not need it. Thus, the most common wrong activities of surgical prophylaxis in Razi Hospital appear to be excessive use of antibiotics. This finding is consistent with reports from developing countries as well as Iran (16, 20, 21), but in contrast to developed country where the most common error in the surgical prophylaxis practice is omission of antibiotics rather than their excessive use (15). The current study also found that all of the patients under study received antibiotics on time. As a routine in the hospital, initiation of prophylaxis is at the time of anesthesia induction. This finding is similar to that of the studies performed in other areas (15, 16). The choice of antimicrobial compounds was appropriate in approximately 87% of the cases. However, six different drugs or drug combinations were used; cefazolin, cefazolin plus gentamicin, vancomycin, vancomycin plus gentamycin, cefazolin plus metronidazole, and vancomycin plus metronidazole. Excessive use of vancomycin and unnecessary use of gentamicin in the study is problematic. This problem is similar to that of a study previously performed (16, 22). Appropriate selection of antibiotics reported by Vaisbrud et al. (15) was 95%, but that of the current work was 86.9%. Surgeons` unawareness to consult with infectious disease specialists and lack of certain guidelines of antibiotics use for prophylaxis in the hospital may be discussed for these differences. In the current study, duration of antibiotics administration was appropriate in 90.5%. The rate of longer duration of administration of antibiotics was 9.5%, which ranged from 2.2% in general surgery department to 13.6% in gynecology department. This finding was inconsistent with that of Vaisbrud et al. with 91% (15). After unnecessary use of antibiotics and selection of antibiotics, the most commonly detected error was too long postoperative administration of antibiotics. Majority of Iranian surgeons insist on the need for prolonged postoperative use of antibiotic therapy to prevent post-operative infections. It is known well that prolonged use of post-operative antimicrobials not only does not provide additional benefit, but also affects emerging the bacterial resistance (7). The current study had limitations such as retrospective design, restriction to just one hospital, and only three surgery departments. Since the condition of all hospitals affiliated to Jundishapur University is similar from the study purposes view point; therefore, restriction to a hospital could not result in significant bias. In conclusion, the current study revealed that about 42% of patients received appropriate prophylactic antibiotics. However, 44% of those who received prophylaxis did not need it. In patients receiving antibiotics, the most common mistakes were antibiotic selection followed by prolonged prophylaxis (> 24 hours), and excess dose of antibiotics. Feeding this information back to surgeons and establishing pre-operative prophylaxis guidelines as a routine activity of infection control teams could improve nosocomial infection control program. This article is derived from medical files of Razi Hospital. The authors greatly appreciate the chief and medical archivists of Razi Hospital. The authors also thank the staff of Jundishapur Infectious Diseases Research Center for their kind cooperation. Authors’ Contributions: Study concept and design: SM Alavi. Analysis and interpretation of data: L Alavi,. Drafting of the manuscript: SM Alavi, Roozbeh, Behmanesh. Critical revision of the manuscript for important intellectual content: Roozbeh, Behmanesh, and L Alavi. Statistical analysis: L Alavi. Funding/Support: This study is supported by Jundishapur Infectious and Tropical Diseases Research Center.